The main character, Cassandra Palmer, is the epitome of the reluctant heroine. 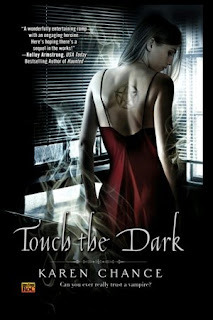 When TOUCH THE DARK starts, she's on the run from a vampire named Tony, but everything starts to fall apart and she's quickly drawn back into the vampire world. From there, we get to learn all about vampire politics and the structures of the magical community, and that Cassie's clairvoyance is even more important than she ever realized. Karen Chance has created a lovely cast of characters (how alliterative!) for the Cassie Palmer world. Each one has a distinct personality and they all bring something neat to the table. My favourites are Mircea, a powerful vampire that Cassie has connections to, Pritkin, a war mage with a bag full of hate for Cassie, and Raphael, a vampire that Cassie's known since she was a child. Mircea and Cassie have such an interesting relationship and it really evolves not just in TOUCH THE DARK but also in subsequent novels. And Pritkin, well, he's amazing talented and incredibly stubborn so I suppose it's no wonder I enjoy him, even if Cassie doesn't. And of course, Cassie is a great protagonist. I really enjoy the reluctant-heroine-comes-into-her-destiny trope, which is used but also turned on its head in this series. Cassie has a sharp mind and wisecracks like no one's business but my favourite aspect of her character is probably that she just wants to live her life for herself, and not be beholden to or controlled by anyone. The fact that she can communicate with ghosts is just a really cool bonus. The world building in this book and series is also wonderful. I decided to do the Daring You To Read... post because I recently revisited TOUCH THE DARK and was struck anew by how interesting this world is. There's a vampire senate, led by the Consul, there are different circles of mages, and then there's the Pythia, the big clairvoyant that everyone wants a piece of. I'd strongly recommend checking out Karen Chance's Cassie Palmer series if you're not already a fan. 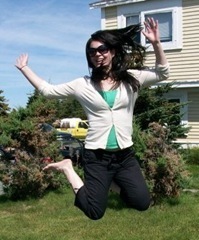 She's a talented writer who's created a layered and engaging world that you won't be able to resist! Can you ever really trust a vampire? Cassandra Palmer can see the future and communicate with spirits -- talents that make her attractive to the dead and the undead. The ghosts of the dead aren’t usually dangerous; they just like to talk -- a lot. This was one of the very first paranormal series I read, a long time ago. I want to re-read them and catch up! I LOVE THIS SERIES! They don't come out quick enough in my mind and the Dory Basarab series is just as fab. I so can't wait for the next one to come out next year.